Look who popped by the store the other day! Hendrix and his Mama (of Just By Living) and his Papa (of The Hipster Dad). 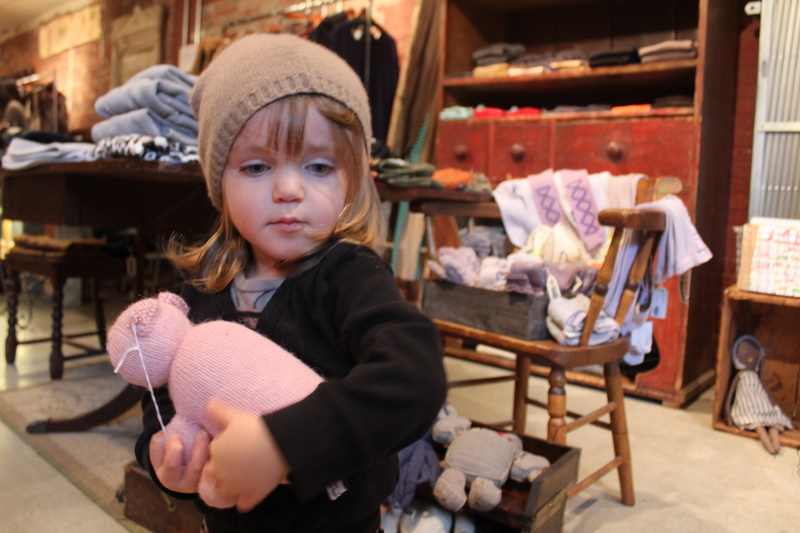 Hendrix was quite smitten by this little pig from I Golfini Della Nonna which kept him entertained while his parents and I got to chit chat. Can’t say it’s a bad day at work when friends are hanging in the shop. We get lots of visits from Sierra and Lauren of Before I Was a Mom, as well. 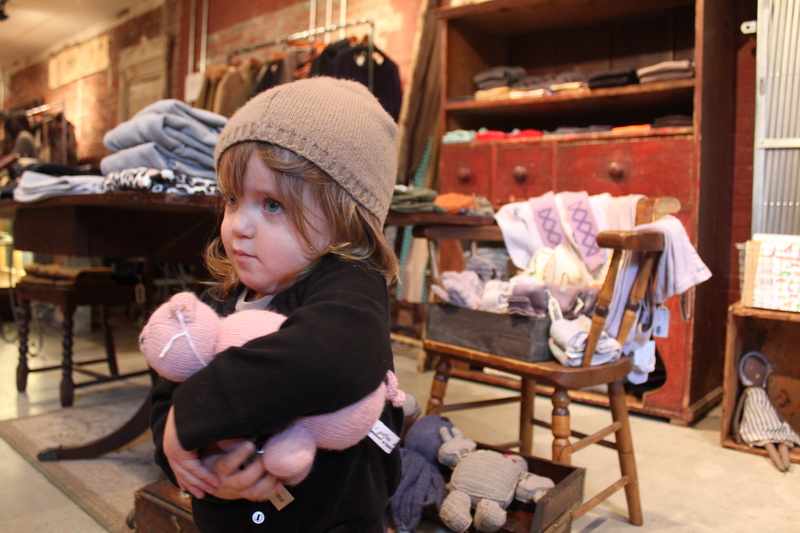 I’ve also had the honor of meeting Jen of Jen Loves Kev and Drea and Marlowe of Oh Dear Drea while they stopped by Monkey & The Bug. I love how this blog community introduces you to so many awesome families. I’m in Wisconsin right now visiting my family. I’m excited for the chance to relax, celebrate, and maybe even blog a little while away from our hectic, day to day schedule. What are you all doing for the Holidays? 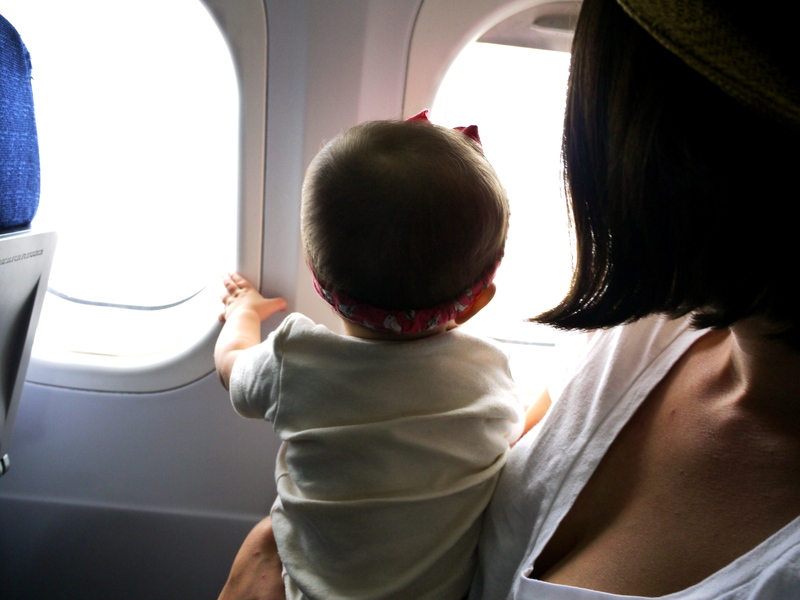 As you know, I started a guest blogger series about traveling with little ones. I got a bit sidetracked since I have been doing a bit of traveling…perfect excuse,no? I was in NYC for a buying trip, we shot our lookbook, and now I in Wisconsin (again) with my fam. I am back on track though and here is a post by Drea of Oh Dear Drea. I am a huge fan of Drea’s blog. 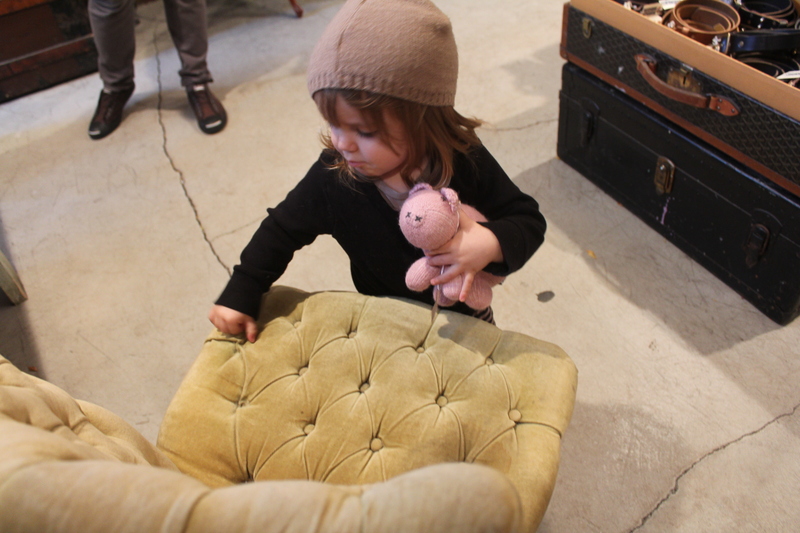 It’s full of sweet stories, pics of her adorable lil lady, Marlowe, and yummy vegan recipes. Be sure to check her out HERE. 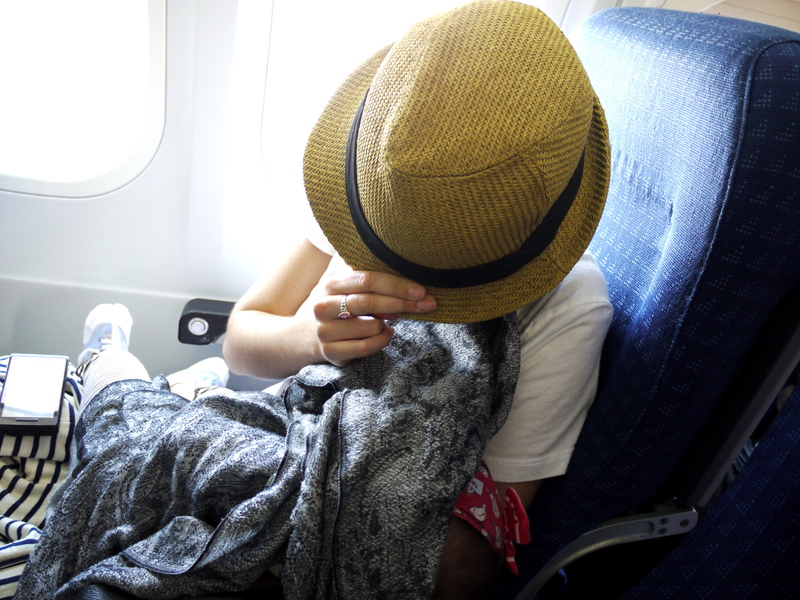 Traveling with a baby: I am not an expert. We’ve traveled twice. Once when Marlowe was 3 months old. The second time she was 6 months old. She’s 9 and a half months now and our next vacation will be a slightly bigger one (or at least have a longer flight) to Massachusetts (soon!). This time with a bigger, more active, louder baby, that wants nothing more than to run around. I’m not very worried…. why? Because I think when you’re traveling with a baby, the best thing you can do is: not take things too seriously. Don’t over think it. I live for over thinking. I have no choice, I am an extreme over thinker— it gets you no where, especially with traveling. Over thinking can actually ruin a trip. Kids are flexible, on the day to day they do whatever you do and go wherever you go, they can do that while traveling too. So what if their nap or sleep patterns get a bit off course or wonky, these things can be fixed quickly when you return home. For now, enjoy every minute! Don’t over analyze what needs to be packed and what you think you might need in EVERY scenario. The first time we traveled, it was by car. We filled up that car with everything imaginable. A (HUGE) playpen, toys, tons and tons and tons of clothes (shoes, boots sandals, jackets, swimsuits, millions of pjs, dresses, skirts), burp cloths, bibs, a breast pump, a baby swing chair, you name it: it was probably packed in the car. We didn’t use most of it. Marlowe slept in the bed, not the playpen. She wore the same pj every night and rotated about 3 outfits. The second time we flew. We brought less clothes, no play pen, no baby sling, very little toys. We did bring the breast pump and a stroller this time. We ended up purchasing a 40$ playpen, that was again, NEVER used. She again slept in the bed. And the stroller was pointless, we carried her (mostly in a sling) everywhere. Basically what I’m saying is you can get by on a few pieces of (wisely chosen) clothing and a sling (or a good set of arms). I’m not going to lie, I LOVE packing (weird right? ), I look forward to packing as little as possible next trip. 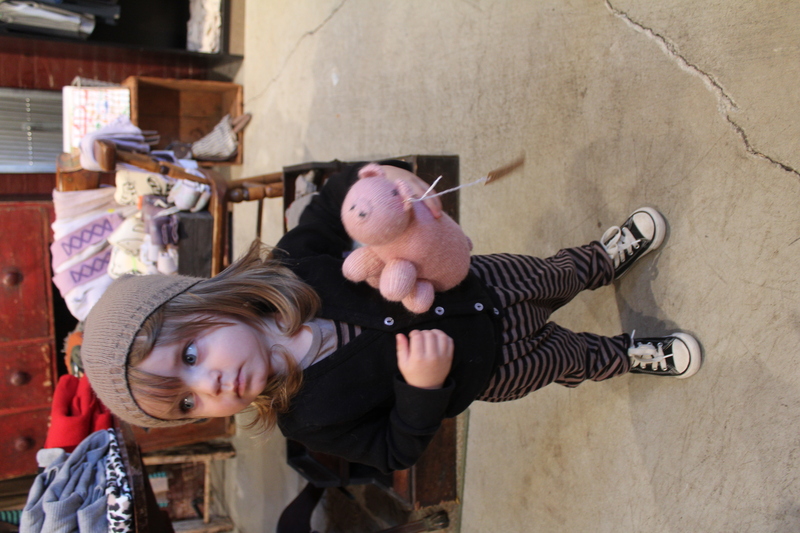 And definitely: don’t let it get to you too much if and when your little one throws a fit. Babies and kids cry. It’s natural. I’m not saying, just let your kid cry it out without at least trying to soothe the problem, but don’t get worked up either. If other people can’t handle your kid crying, then thats their problem. Traveling is supposed to be fun. No matter what happens it will definitely by and adventure traveling with a little one, so just: enjoy it!